Deep Vellum Publishing, 9781941920695, 352pp. The work of a masterful novelist and translator collide in this visionary and hilarious debut from acclaimed French writer Brice Matthieussent. Revenge of the Translator follows Trad, who is translating a mysterious author's book, Translator's Revenge, from English to French. The book opens as a series of footnotes from Trad as he justifies changes he makes. As the novel progresses, Trad begins to take over the writing, methodically breaking down the work of the original writer and changing the course of the text. The lines between reality and fiction start to blur as Trad's world overlaps with the characters in Translator's Revenge, who seem to grow more and more independent of Trad's increasingly deranged struggle to control the plot. 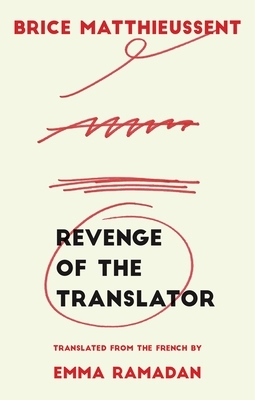 Revenge of the Translator is a brilliant, rule-defying exploration of literature, the act of writing and translating, and the often complicated relationship between authors and their translators.